Will Wen's visit bring North Korea back to the table? (CNN) -- Can Chinese Premier Wen Jiabao persuade North Korea to return to the six-party talks on its nuclear weapons program? 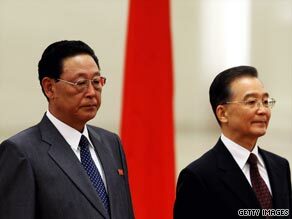 Wen Jiabao (right) began a three-day visit to North Korea Sunday. North Korean leader Kim Jong Il greeted Chinese Premier Wen Jiabao at the Pyongyang airport Sunday, kicking off a three-day visit to the reclusive nation, China's official Xinhua news agency reported. The visit comes amid efforts to draw North Korea back to six-party nuclear disarmament talks. North Korea pulled out in April, protesting the United Nations' condemnation over its nuclear test and missile launches. The six-party negotiations include the United States, South Korea, Japan, China and Russia. Pyongyang has recently signaled its willingness to re-engage with the United States. As North Korea's close neighbor, traditional ally and main provider of economic aid, China is widely believed to hold the key to solving the North Korea conundrum. "Premier Wen's visit, by definition, must be a success or he would not go," says a political analyst who periodically visits Beijing and Pyongyang. Aside from signing a package of economic, trade, education and tourism agreements, says Chinese Foreign Ministry spokeswoman Jiang Yu, Wen's visit is also aimed at "summarizing the past and mapping out the future." The trip resulting in a return to the talks is a best-case scenario, says the political analyst, "Wen will be in a position to claim credit for getting the parties back to the six-party talks, and for China to portray itself in a responsible role. It will re-position China as the regional leader and honest broker in the Korean conflict." Such a breakthrough will not come easily. North Korea remains economically depressed, politically unstable and diplomatically isolated. Acrimony between North Korea and the United States continues to fester. Its ties with Japan remain tense, bedeviled by a dispute over Japanese citizens abducted by the North during the Cold War. In the past year, North Korea has swung back and forth between engagement and animosity. At the core of North Korea's problems was its tattered economy. "There appears to be modest progress in Pyongyang, but it is superficial," says a political analyst who visited North Korea recently. "Go outside the capital and people appear visibly different. They look haggard, gaunt, poorly dressed, underfed. "I believe there is a general understanding by U.N. agencies and NGOs that while the DPRK is not in a food crisis like it was a decade ago, vulnerable groups such as nursing mothers and children are at risk of serious malnutrition." Its internal problems are compounded by its diplomatic and economic isolation, says Mike Chinoy, senior fellow at the University of Southern California's U.S.-China Institute. "The North Koreans saw a conservative government in South Korea try and unilaterally rewrite the rules and move away from the Sunshine policy. They saw a conservative government in Japan that was so fixated on the issue of the Japanese abductees that they would not engage at all. And they saw the Bush administration so internally divided that the signal sent to North Korea about what was possible kept getting changed. "By mid or the latter part of 2008, the North Koreans were doubting that there was much chance of getting anything from the U.S."
In the spring this year, Pyongyang upped the ante with spate of missile and nuclear tests. These prompted international condemnation and severe United Nations sanctions. Even China, irritated by the North's intransigence, voted in favor of the U.N. sanctions. President Obama, meanwhile, vowed not to reward North Korea's bad behavior and pressed China to enforce the U.N. sanctions. Heightened tensions coincided with speculations over the health of North Korean leader Kim Jong Il. After suffering a stroke last year, he looked frail in official photos, prompting speculations of imminent political succession and handover of power from him to one of his sons. Last August, however, those questions largely dissipated after former U.S. President Bill Clinton visited Pyongyang. There he talked and dined with Kim and won the release of two imprisoned American journalists who were imprisoned for illegal border crossing and "hostile acts." That was just one of the conciliatory signals North Korea sent out in recent weeks. Kim met with a South Korean tycoon and agreed to resume several tourism ventures, which allow people from the South to visit the North for family reunions. Kim also sent a delegation to attend the funeral of Kim Dae-jung, a former president of the South and proponent of the "sunshine policy" of reconciliation with the North. Chinoy, author of the book "Meltdown: The Inside Story of the North Korean Nuclear Crisis," explains North Korea's new tack. "The North Koreans are in an engagement mode. They sorted out their internal circumstances, Kim is basically recovered from health problems and is very much in charge and I think the North is seeking to reach out diplomatically across the board, including the Chinese. They are clearly signaling their desire to talk to the Americans, to the Japanese and they already are talking with the South Koreans. So the North is in a diplomacy mode, and Wen Jiabao's visit fits into that." Even though China has sometimes lost patience with its northern neighbors to the point of voting for U.N. sanctions against Pyongyang, analysts like Chinoy do not expect the Chinese this time to squeeze the North Koreans. He says: "Wen Jiabao is not going to read the riot act or compel them to do something. It will be unrealistic to expect that to happen." Dai Bingguo, China's emissary who met Kim Jong Il last month to prepare for Wen's visit, signaled that North Korea remains interested in bilateral and at some point multilateral talks with the United States, Japan and other parties. Still, diplomatic breakthroughs from Wen's trip could remain elusive. Says Chinoy: "I don't know that Wen will come back and announce that North Korea has agreed up front to return to the six-party talks. I don't think that's on the card. But I think the North will clearly indicate that they want to move diplomatically. They want to see if there is any prospect for a bilateral U.S. engagement with North Korea." To be sure, some cynics say the North is not serious about giving up its nuclear ambitions and its recent political moves are mere stalling tactics. "My own feeling is, until people talk to the North we are not going to know what is possible," Chinoy says.